A working boot for work or play. 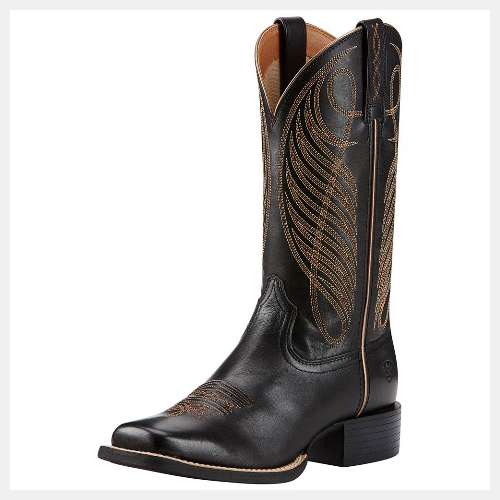 Ariat boots are made to cushion the foot while stabilizing the heel and arch, which dramatically reduces fatigue and stress to the feet, legs, and lower back. Ariat technology can be found in a variety of casual Ariat shoes as well - providing you with comfortable alternatives for time out of the field and off the saddle. Feature: Full-grain leather upper in smooth black finish, 11" shaft height, square toe, classic cowgirl heel, Ariat's 4LR Technology, six-row stitch pattern on vamp and Duratread outsole provides maximum wear-resistance with flexibility.